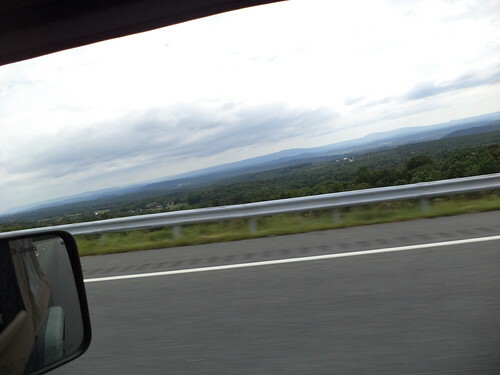 Thursday, August 22nd, I headed home from Virginia. It had been a lovely visit. I made the decision to go a different route back because of all the construction I had encountered in Ohio. 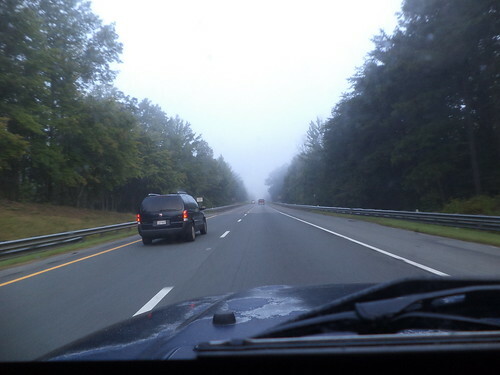 I love driving in the fog, as long as I either know the road or, in this case, it was Interstate and I could be fairly certain of the highway. The fog only lasted an hour. The morning was impossibly beautiful. The above photo was taken on I-64 west of Charlottesville. I hadn't seen this scenery the previous week because it was dark. At the intersection of I-64 and I-81, I went right, north. 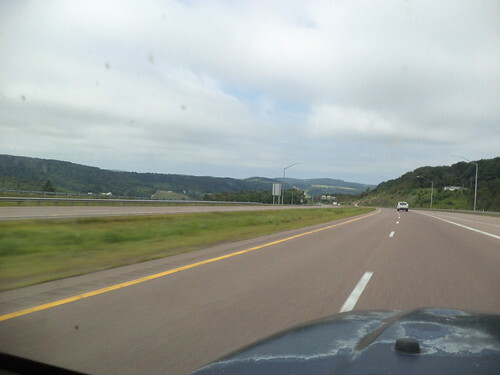 I drove north to almost the Pennsylvania border, meeting I-70 in Maryland, and turned left, to head west. Here's where I met the mountains. I've driven this section before, back in 2011. Some of the scenery seemed familiar but it's still new. I-70 gave way to I-68 and I approached this cut through the mountains. This was familiar. I noticed on the way out that there just weren't very many bug splats on the window. There were more on the way home, but I remember years of travel where you'd use the windshield wipers and the sprayer in an effort to get the bugs off the windows. Are there less bugs? Did I happen to travel during a time when bugs aren't plentiful? Or was my travel through a bugless area? 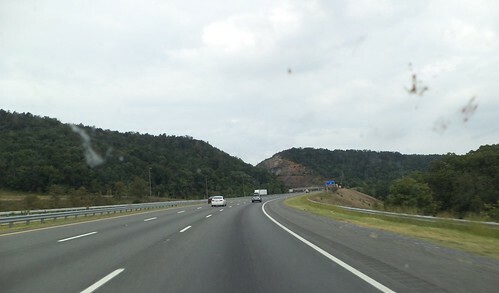 I-68 is designated the "National Freeway" and passes through some beautiful scenery in western Maryland. Notice I'm in the right lane. 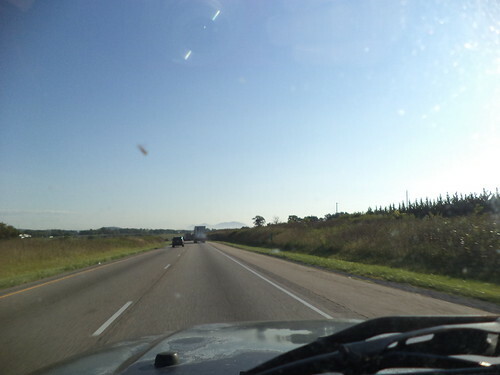 It was this drive where I really encountered the slowness of the Jeep. Try as I might, I couldn't build up enough steam to sustain even 60 miles per hour. My speed dropped to around 50 when I would finally clear the top of these mountains. 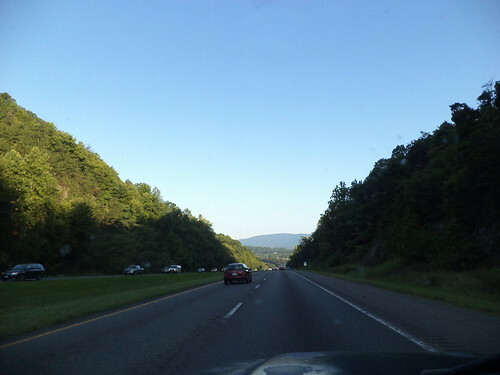 This photo is a good example of the "Blue Ridge Mountains". Notice the difference in color. The highest peak I cleared topped out at over 2800 feet. This is the time you want someone else with you so someone could take a photo of the nice sign they put up letting you know that, yes, your ears have popped because you're over 2600 feet. Here I am in West Virginia. 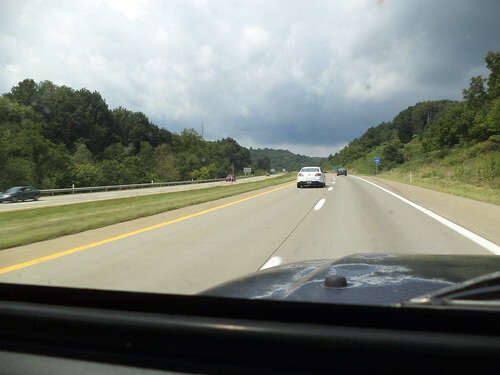 I met up with I-79 and headed right, to the north, to Pennsylvania. Western Pennsylvania still contains similar mountains. 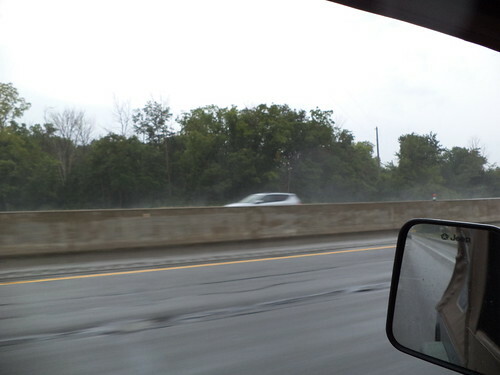 I knew, from checking the weather, that I could be driving into rain. 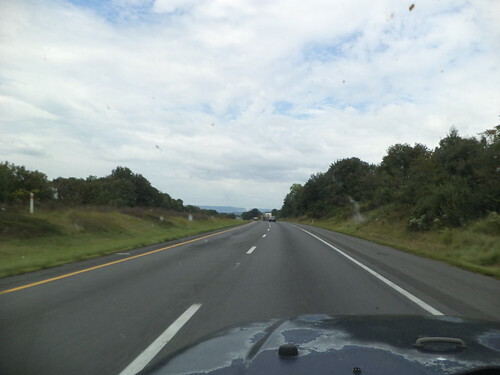 Although the overcast weather in Maryland and West Virginia, kept the temperatures cool, once I got into Pennsylvania, the temperature went up, even in the mountains, by about 15 degrees. And there, like a wall, were the rain clouds. It turned out, however, that I drove around the rain for at least an hour. 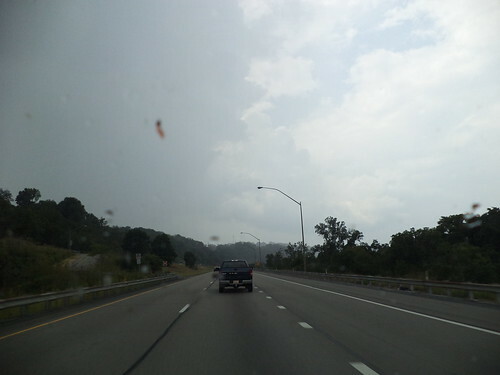 North of Pittsburgh, we met, but it wasn't much to speak of, a brief shower moving from left to right and I drove out of it as quickly as I drove into it. It didn't cool off the air at all. I picked up good old familiar Interstate 80, turned left and headed west. Oh hey! I know this intersection. I waved in the direction of April and Perry's. 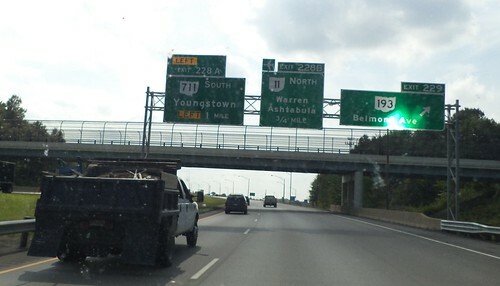 Next time, I hope my trip allows me to see all the people I know around Youngstown. 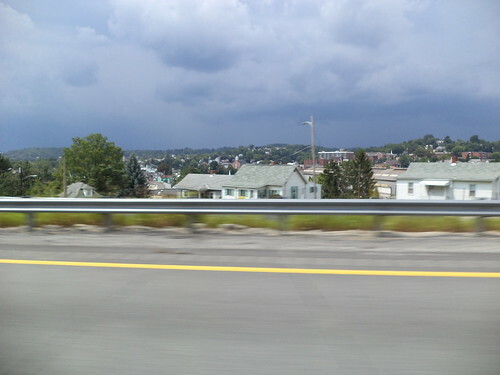 As I headed west, I could see the rain south and west of me. It seemed like all the hype about "heavy" rain or even any kind of rain wasn't going to happen. 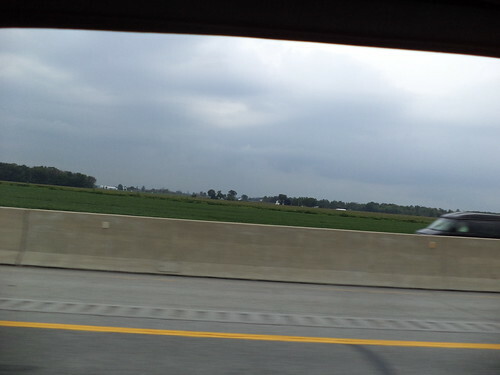 But it was in western Indiana when I finally met the rain which actually cooled things off. I love driving in rain. I love the swoosh of the wipers and the rattle of the rain on the roof. In the summer, I love the change of smells from hot pavement to steamy pavement to cool, wet pavement. I love the look of the land in the rain. Beyond this, it grew too dark to take photos and I could feel how close home was. When I pulled in the drive, 16 hours after leaving Richmond, I was exhausted, but nothing is quite so wonderful as knowing you're home. Would I go that route again? It's all Interstate, unlike the route out. I'm not sure. Knowing that there is major construction in Dayton and how poorly marked the intersection of the two routes was where I had to leave the Interstate and pick up the US Highway, I'm not inclined to want to go that way. But the way out was 2 hours less time and that's a strong consideration in travel. There are a number of ways to get from here to there and back again. If this becomes a yearly event, I'll have a chance to experience them all.